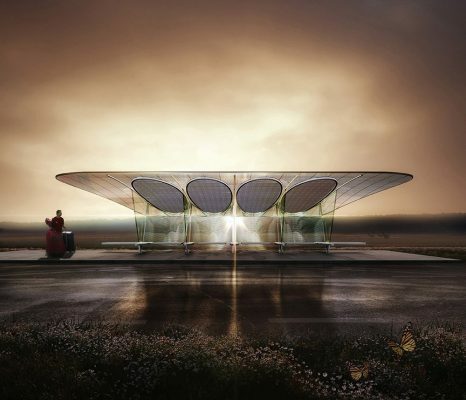 The competition was to take a bus shelter, an atypical, ubiquitous object within the public realm, and create a design for a rural area of Denmark under the sponsorship of a glazing manufacturing company. The point of departure for the architecture of this entry is the formal negotiation between the delicacy of the glass and its structural integrity to meet the project’s programmatic purpose. The design needed to be self-referential and authoritative in the landscape. 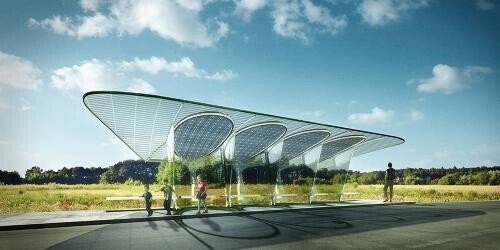 Trees, weaving grass, and big canopies were key inspirational organic forms. The gentle nature of the Danish environment became the source for the proposed biomorphic volume. Like a graceful butterfly, this structure radiates its immaterial presence to its surroundings during the day as well as night. 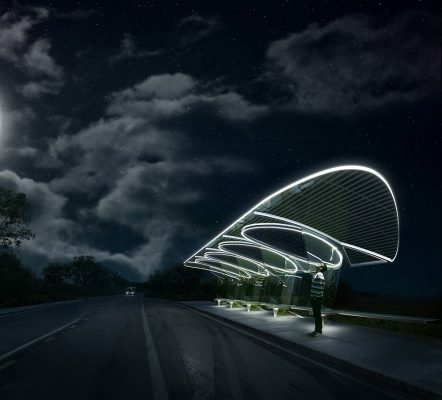 This scalable transparent container, almost a frozen membrane, is a place of protection, sheltering users from rain, wind, and sun. Despite its seemingly imminent flight from the ground, this artifact is securely anchored to the soil through unobtrusive steel connections. Maximum structural integrity is provided by the graceful, U-shaped glass bays. The bays are scalable to afford a variety of seating arrangements for those who are alone, couples, or groups of friends with deep protection from wind and rain. 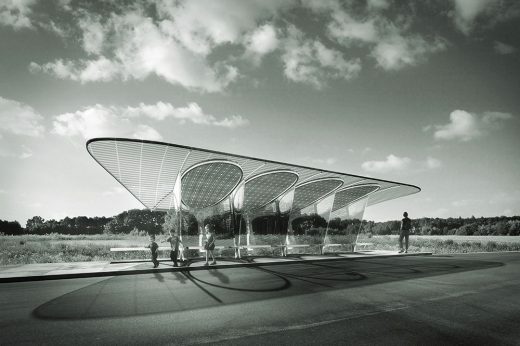 The elliptical photo voltaic panels laid on the roof and directly above the bays have the dual function of harnessing solar energy to power the structure and serving as sun shading devices to shield those sitting below.